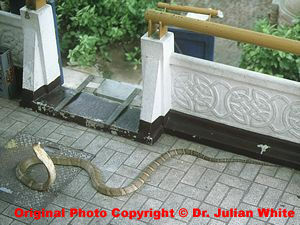 Very large in length, tapering, slender bodied snake, withmedium to moderately long tail. Capable of extending the neck region into a long and narrow hood. World's largest venomous snake. 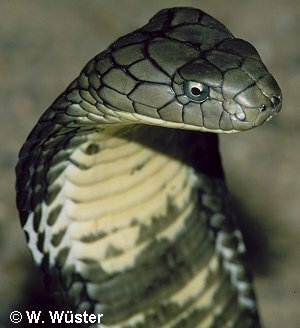 Can grow to a maximum of about 5.85 metres ( but rarely found to exceed 4.30 metres ). Head is moderately short, flattened, moderately distinct from neck, with a broad, rounded snout and an indistinct canthus. Eyes are medium in size with round pupils. Dorsal scales are smooth and oblique with anterior vertebral row and outer 2 scale rows enlarged, posterior portion of body often with the middle 3 rows enlarged. Dorsal scale count ( 19 or 17 ) - 15 - 15 ( 13 ). Wide range of habitats. Jungle and primary and secondary forest, woodlands, open fields and foothills at elevations up to about 1800 metres. Cannibalistic, terrestrial and diurnal. Non-aggressive and will escape to cover if disturbed but does have a reputation for aggression when brooding. Fearless snake which will not hesitate to stand its ground If provoked or cornered. It will raise its forebody high off the ground and spread its hood and make a growling-like noise in defense. Feeds almost entirely on snakes, occasionally lizards. 421 mg ( dry weight of milked venom ), Broad et al (1979). ( Ref : R000006 ). 350 to 500 mg ( dry weight ), Minton (1974) ( Ref : R000504 ). 101.9 mg ( dry weight ), Gopalakrishnakone and Chou (1990) ( Ref : R000004 ) p 255. 1.80 mg / kg sc ( mice ), Broad et al (1979) ( Ref : R000006 ) in Gopalakrishnakone and Chou (1990) ( Ref : R000004 ). 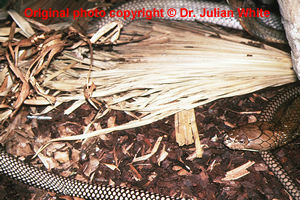 Venom of some studied specimens contains an unusual three-finger cardiotoxin that, unlike other elapid cardiotoxins, induces bradycardia, not tachycardia.